The function of protective relaying is to cause the prompt removal from service of any element of a power system when it suffers a short circuit, or when it starts to operate in any abnormal manner that might cause damage or otherwise interfere with the effective operation of the rest of the system. The relaying equipment is aided in this task by circuit breakers that are capable of disconnecting the faulty element when they are called upon to do so by the relaying equipment. Circuit breakers are generally located so that each generator, transformer, bus, transmission line, etc., can be completely disconnected from the rest of the system. These circuit breakers must have sufficient capacity so that they can carry momentarily the maximum short-circuit current that can flow through them, and then interrupt this current; they must also withstand closing in on such a short circuit and then interrupting it according to certain prescribed standards. 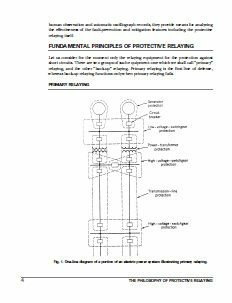 Fusing is employed where protective relays and circuit breakers are not economically justifiable. Although the principal function of protective relaying is to mitigate the effects of short circuits, other abnormal operating conditions arise that also require the services of protective relaying. This is particularly true of generators and motors. Hello,your site is very great.Thank you.